Walk through any big supermarket or corner shop in the country and convenience foods, from microwaveable meals to pre-cooked meat, are ubiquitous. The horsemeat scandal has shown how complex the UK's meat supply chain has become, and it also highlights how little retailers and customers alike know what is actually going into the food that we eat. 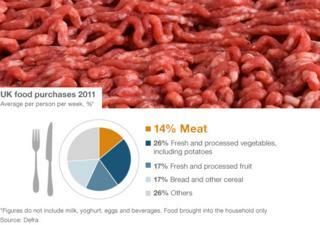 Meat represents 14% of a household's weekly food purchases on average, according to a 2012 report from the Department for Environment, Food and Rural Affairs (Defra). While data from Defra's Family Food report shows there has been little change in the proportion of meat people have been buying in the UK for decades, there is a marked difference in the type of meat being purchased. The quantity of ready meals and convenience meat products - including kebabs and chicken kievs - the British public bought increased by 480% from 1974 through to 2011. That stands in stark contrast to weekly household purchases of fresh cuts of meat, such as lamb, mutton, pork, beef and veal, which have all experienced noticeable drops. The Family Food report figures show chicken became a more popular meat than beef for the first time in 1988 during the BSE crisis - when the public boycotted British beef after a link was established between BSE carried by infected cattle and the human form of the disease, CJD. Purchases of ready-made burgers - which were the original focus of the horsemeat scandal - have been relatively consistent over time. Italian food passed English to become the biggest selling ready meal cuisine in 2011, with sales of £406m. The UK market for chilled and frozen ready meals is valued at £1.85bn and grew 6.6% in 2011, according to market research company Key Note. But the market was rocked after horsemeat was found in some frozen lasagne and spaghetti Bolognese products this month, including some Findus beef lasagne products which were found to contain 100% horsemeat. Price is the most important factor for shoppers when they are deciding which foods to buy, according to Defra's 2012 Food Statistics Pocketbook. More than 40% of customers said it is the most important factor, with 90% listing it in their top five. Food prices have risen by 12% in real terms since 2007 and, after years of price falls, are now back up to 1997 levels. That has resulted in those in low income households cutting back on fruit, vegetables and meat like beef, pork and lamb, Defra says. Food writer Rose Prince compared the horsemeat revelations to the BSE crisis of the 1980s and thinks the current crisis will lead to a lack of trust from the public in convenience food. "We've come to believe religiously in convenience food without thinking too much about where it comes from because we trust suppliers and retailers," she said. "What we're seeing now is as a result of the constant drive to keep food prices low."